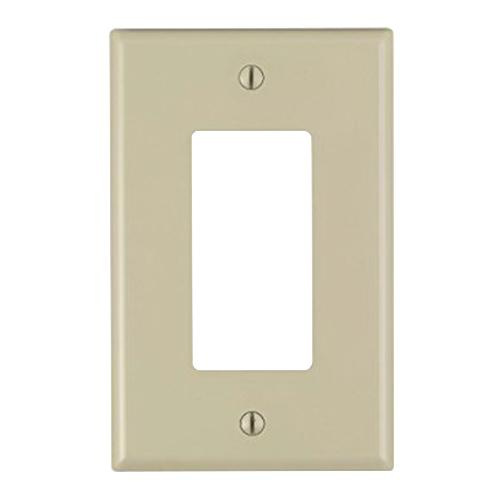 Leviton Decora® 1-Gang Midway size decorator wallplate in ivory color, features thermoplastic nylon construction. It measures 4.88-Inch x 3.13-Inch. This device mountable wallplate in rectangle shape, is ideal to place in vertical orientation. It has smooth face and rounded edges that resist dust accumulation. This wallplate comes with color matched metal mounting screws. It has high-dielectric strength and arc resistance. Wallplate is resistant to fading, discoloration, grease, oils organic solvents and moisture scratches. It is suitable for residential and commercial applications. Wallplate is UL listed and CSA certified.